The Light Tank M24 Chaffee is a Rank III American light tank with a battle rating of 3.3 (AB/RB/SB). 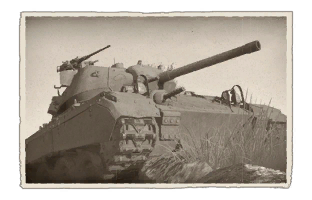 It was introduced along with the rest of the initial American ground tree in Update 1.45 "Steel Generals". The M24 Chaffee is a big improvement over the American light tank path from the Stuart tanks, presenting a better driving handling and a 75 mm gun. Suspension wheels and tracks are 15 mm thick. Belly armour is 12.7 mm thick. Gun barrel is 20 mm thick. Heavy tanks like KV-1 (L-11)s and KV-2s or possibly Shermans if in a mixed game. Medium tanks with applique armour such as the Panzer III Ausf. M and etc. Medium tanks and Light tanks like Panzer III Ausf. J1 or the T-50. The M24 Chaffee is a very good tank with a fairly interesting play style. Instead of being permanently stationed at a single point and continuously firing at an enemy, this tank offers impressive maneuverability and speed which allows it to perform impressive flanking maneuvers. The M24 can travel at around 38 km/h forward and -25 km/h backwards. Its reverse speed is very good if a quick getaway by going backwards is needed. Thus, this tank excels at "peek-a-boo" tactics in which one hides behind a rock or other large piece of cover and repeatedly inches out to fire at an enemy. The tank offers a 75 mm M6 gun, which has a slower reload than the Sherman's 75mm M3 gun but is otherwise the same. 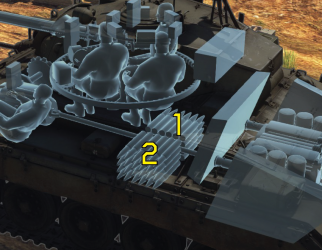 Its shells come in handy for certain tanks; they generally penetrate armour very well. It is rare to experience a ricochet or be to unable to penetrate any armour. Do not: Continuously shoot at a tank without backing up/moving. The vehicle's armour is very thin and will most likely be destroyed if it stays in one position and does not stop changing positions. Always try to get the first shot off in a head-on attack. Typically, the best shell to use is the M61 shell but it can also be beneficial to have M72 shells as well. Another way to go around is to flank the enemy. If attacking with a more direct approach, keep hidden behind a building or boulder and pop out every now and then to take a shot at the enemy. Also, prioritize targets who are busy fighting others and cannot retaliate. Usually, after the first shot, it may disable their tank depending on what it is. Disabling the enemy tank's crew, tracks, engine, etc. allows for retaliation without the risk of any incoming enemy shells. The best cannon for light tanks in its rank. Very fast reverse, thanks to the 4-speed reverse gear. Equipped with a vertical plane stabilizer, allowing for more accurate shots on the move or shoot-n-scoot tactics. Pintle mounted HMG allows for air defense. Thin armour on all sides. Low ammo count can be a problem in long games or RB/SB matches. Reload is quite slow for its caliber. As early as 1942, the light tanks M3 and M5 Stuart have been seen as severely lacking in the modernizing design of tanks and how they fight. The armour was seen as insufficient and the 37 mm gun was also deemed useless against even the standard German tanks like the Panzer III and Panzer IV. The system needed an upgrade, specifically a light tank that mounts the 75 mm gun seen on the Shermans. An attempt to mount a 75 mm gun on a Stuart was deemed inefficient as it reduced ammo stowage and left the armour too thin on the design. In April 1943, the U.S. Ordnance Department worked with Cadillac to start on a project for the new light tank, designated Light Tank T24. The powertrain and transmission of the M5 Stuart was used with the ultimate goal of producing a vehicle weighing less than 20 tons. This left the vehicle with relatively thin armour to stay lightweight. At the time, a lighter 75 mm gun was developed for mounting on the B-25 Mitchell bomber without sacrificing performance, and this was mounted onto the light tank in development. The tank used 410 mm wide tracks with a torsion bar suspension that greatly improves cross-country travel. The engine was a Cadillac 44T24 V-8 petrol engine. The chassis was designed with the expectation that it would be used as a basis of many different vehicle roles so it was called the "Light Combat Team". The light tank end design had a low profile at 9 ft. 1 in. height and featuring a crew of five with a three-man turret, an improvement over the two-man turrets of the Stuarts. The first finished vehicle arrived on October 15, 1943 and was deemed a success, starting a contract for 1,000 units that was later raised to 5,000 units. The vehicle was classified as the Light Tank M24 and as the Chaffee by the British after US General Adna R. Chaffee, Jr., who helped develop some of America's earliest tank designs. The vehicle was produced by Cadillac and Massey-Harris from April 1944 to August 1945 with a total of 4,731 units produced. The first batch of M24s reached the battlefields of Europe in November of 1944 and first assigned to the U.S. 2nd Cavalry Group in France. The M24 gradually entered widespread use by December 1944, some Chaffees went to the British to replace their Stuart tanks as well. The M24s were first used in the Battle of the Bulge with the 2nd and 42nd Cavalry Reconnaissance Squadron sent to support the southern sector of the battle. The Chaffees were slow to enter use in the front-lines as even by the end of the war, some armoured division did not have the M24 light tanks. Despite that, the reception of the Chaffee was positive even though it may not have the firepower to fight the better German tanks like the Panther tanks. The 75 mm gun gave the crew much more firepower than the earlier 37 mm. The light armour, though allowing the tank to pick up speed, was penetrable by most anti-tank weapons in service by Germany. 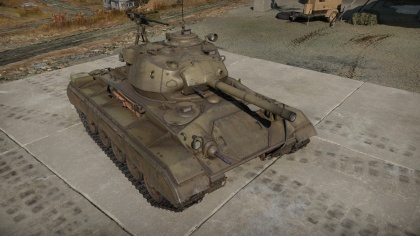 The effect of the M24 Chaffee in World War II was deemed insignificant as it was not used in great numbers in comparison to the Stuarts in service since the start of the war. The M24 Chaffee served a greater role in the Korean War and were sent in large numbers to combat the North Korean Armoured Forces, however they were severely undergunned with their 75 mm cannon and the light armour was easily destroyed by the Soviet-supplied T-34-85 tanks. Plus, the deficiency in crew training also contributed to the poor performance of the M24 against the North Koreans. Due to their inferiority, they were used as a delaying measure until better tanks like the M4A3E8 Shermans and M26 Pershings could be brought in. Once with supports with these better tanks, the Chaffees were relegated to reconnaissance roles, where they served with better results. The M24, after being replaced in America by the M41 Walker Bulldog, was sent to many other countries for use. The French Army deployed the M24s during their fighting in Indochina and famously in the Battle for Dien Bien Phu. Some M24s went to the hands of the ARVN in South Vietnam to support the troops during the Vietnam War. The Pakistani Army used them as well in 1971 against India during the Indo-Pakistani War. The M24 Chaffee was also adapted in different roles by using the chassis for different designs, such as the M19 TGMC anti-air gun and self-propelled guns with the M37 105 mm HMC and M41 155 mm HMC. The Chaffee had turned out to be one of the greatest light tanks the Allies developed during World War II. Though arriving too late to be a main turning factor for the war, the design has turned out to be so reliable that some countries like Uruguay still operate modernized versions. Austria has since retired its M24 fleet, but their turrets still serve on as bunkers. This page was last edited on 16 March 2019, at 22:20.